"I like to be inspired by a narrative which mirrors or tells a story of an everyday moment in life. I am searching for a sense of deeper meaning within human form; stories of loves and losses; characters from a play; a response to a news article. I wish to evoke 'feeling' and mirror the 'gesture' through the use of fast marks, quick making techniques and 'sketches'. 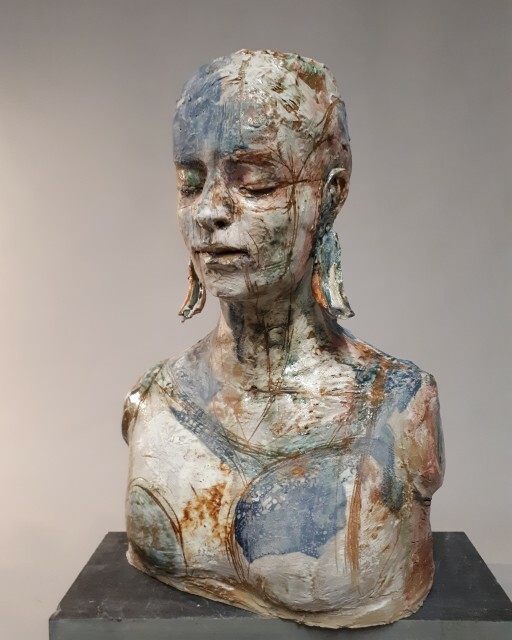 My work sometimes has an unfinished quality which adds to the idea that the figure is a suggestion of a living being rather than a still ornamental object. It is important to me that my figures have an identity and are able to connect with an audience in a non physical sense. 'Faun' is part of a current body of work which is a direct response to the landscape found in Shropshire and the Welsh Borders. I am inspired by the stories of the woodland and green space surrounding my home in Shropshire; exploring the world of dense dark forests, which are roamed by deer and where scurrying creatures reside. I want to give the creatures of the forest a voice, merging animal with human form. I am using Folklore and Myths to help narrate my work and this helps me find inspiration for characters." Sharon Griffin grew up in Telford, attended the University of Wolverhampton and graduated with a BA (Hons) degree in 3D design (ceramics). Sharon Griffin has had exhibitions with us in 2017 & 2018. She will return again with a new body of work in May 2019.